Sculpey Soufflé - Experience a different kind of polymer clay. Soufflé is an innovative lightweight clay perfect for jewelry making! It's strength and ability to hold detail makes it an excellent clay for advanced techniques such as mokume gane, bargello and caning. It is strong, self supporting and will not crack when baked in large pieces. Beautiful suede finish when baked. 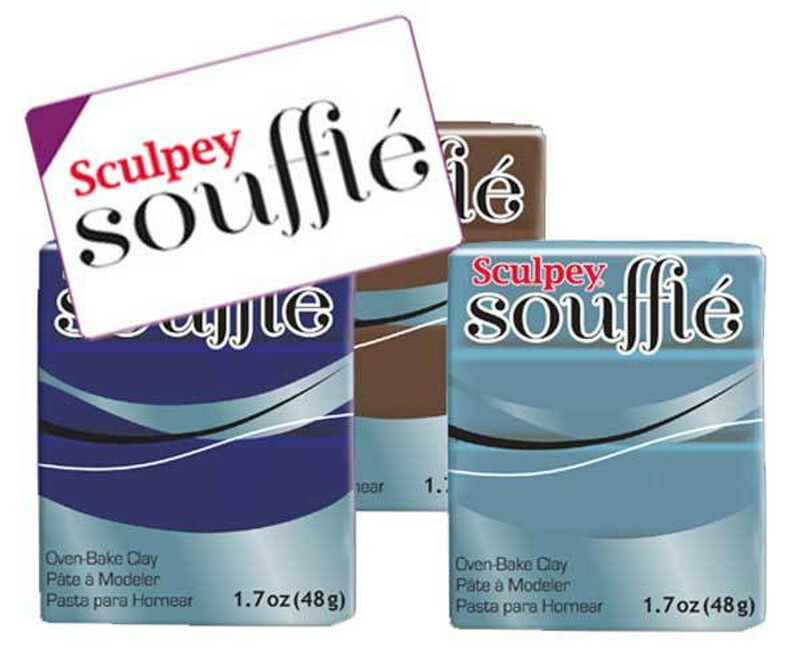 Sculpey Soufflé comes in 22 fashion forward colors. Take a look at the review by Ginger of The Blue Bottle Tree. Claire Maunsell says "So, based on my experience with Souffle, I would view it not as a hobby clay, but as a very unique specialty clay that perhaps needs to find the right user. You should definitely try it if your work involves any forming by stretching or moving of the clay body. Or post curing surface painting of any kind, as it has a tooth on the cured surface that is very ready to accept paint. Also try it if you just want a break from really stiff clays – my hands appreciate it! It’s a clay that gets working quickly after you handle it, even when you’ve let it rest for a long time…"
Read more of Claire's review here.